Is anyone else ready for a simple pot of rice and beans? I know I am, not just as a counterpart to more festive and celebratory holiday fare, but also because this is the food I crave when I’m busy, stressed, distracted, whatever. (Come to think of it, I crave this food all the time, but especially when I need grounding.) I make a lot of rice and bean dinners, but lately I thought to use my turmeric rice recipe as the base. This one pot turmeric rice, beans & greens dinner is the happy result. It’s nothing fancy, but it’s quick, nutritious, and good, and that’s more than enough for me. Turmeric rice has become a bit of a staple around here, a dish I make for bowls, burritos, and a lot more. As it turns out, the rice works as nicely in a cohesive dish as it does as a side or a component of a meal. I changed the recipe slightly here: the onions are thinly sliced and caramelized, rather than chopped and sautéed, which adds a little more flavor to the dish. I increased some of the spices in order to flavor the beans and greens as well as the rice. And I finished the dish with both lemon and lime juice, so it’s a little more tart than my original recipe. Once the rice is cooked, the rest of this meal is as easy as stirring in some cooked beans, wilting in spinach with an extra splash of water, and then seasoning to taste. If you use white basmati or long-grain white rice, the whole thing is ready in about 30 minutes. If you use brown basmati (or long-grain brown rice), it’ll take closer to 40, which isn’t bad for a complete meal. Serve the rice with yum sauce for a serious treat (and double the golden color), or top it with toasted nuts or seeds for some crunch. Heat the oil in a medium pot or a deep skillet over medium heat. When the oil is hot, add the onions. Caramelize the onions, stirring frequently, for 12-15 minutes, or until they're a deep golden brown color. Add splashes of water as needed to prevent sticking. When the onions are ready, stir in the garlic and cook for 1-2 minutes, or until fragrant, stirring constantly. Add the rice, turmeric, cumin, coriander, salt, bay leaf, and water to the pot. Bring to a boil, reduce heat to low, and cover. Simmer for 12-15 minutes (for white rice) or for 30-35 minutes (brown rice), or until the rice is tender. Pour in the extra 1/2 cup water, then add the spinach to the pot, piling it over the rice. Cover the pot again to allow the spinach to steam and wilt down for 2 minutes. Then, stir the spinach into the rice, so that it wilts down completely. (If you need to add a few splashes of additional water as you do this, go for it.) Finally, stir in the kidney beans, lemon and lime juice, and black pepper to your liking. Taste the rice, adjust seasonings as needed, then stir in the cilantro and green onion tops, if using. Serve drizzled with yum sauce if you like. *You can water sauté the onion instead of sautéing with oil if you prefer. Leftover rice will keep in an airtight container in the fridge for up to 5 days. In place of kidney beans, feel free to use black beans, pinto beans, black eyed peas, or chickpeas, and you can also play around with the greens. I like using spinach for one pot meals because it cooks so quickly, but chopped kale, chard and collards would all be great in the dish, too. 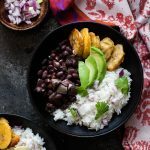 “I’d be more than happy with rice and beans.” This is something I’ve smilingly said to friends who are fretting about what to cook for a vegan when I come over or stay with them. I’m trying to assure them that I love simple food and that veganism isn’t complicated, but it’s a genuine statement about my tastes, too, because I love rice and beans in pretty much any form. This flavorful, colorful mixture will definitely be a new go-to for me. Hope you enjoy it, too, and I’ll also be back later in the week to share a hearty, wintery, Mediterranean-inspired soup. Till then, be well. I tried this for dinner tonight and loved it! Goes great with sriracha on top too. So glad you enjoyed it, and that’s a great topping suggestion! Looks tasty, how long do you soak the rice? 10 minutes is fine. Just updated the recipe—thanks for asking! Made this last night, subbing black beans for kidney beans and broccoli for the spinach. So delicious and flavorful and now I have lunches for the rest of the week. I also just preordered your new book! I love one pot meals. This was delicious and easy to make – thank you for posting! A nice twist on rice and beans, comforting and nutritious. The tip about sriracha was spot on as well. I made this recipe last night. It was delicious and so easy! I used brown rice, though, and prep and cooking took longer than 40 minutes from start to finish. I assume the 40 minutes listed at the top of the recipe is for white rice, so other people planning to make this with brown rice just be aware that you will need more like an hour. Also, I used a mix of spinach and arugula since I didn’t have enough spinach, and I can confirm that arugula works well too. SUBLIME. I loved this so much. I swapped garbanzos for kidneys and topped it with salted and limed coconut yogurt. My new go-to rice and beans, absolutely divine. Be SURE to soak the rice first! I missed seeing that plus I used brown rice and the cooking time pretty much doubled, plus I had to keep adding water. Sprinkled a few pine nuts on top for crunch/glavor. This reminds me of mujadarra, a Lebanese lentils/rice/caramlized onions recipe. Every recipe I ever read that says to caramelize onions in 12-15 minutes underestiates the amount of time it takes to truly caramelize. I know that so Iadjust, but it’s not fast frying–it’s slow and delicious. So we made the change a couple of weeks ago and it has been somewhat challenging (more so around dinnertime) because neither of us can really cook. Not only did this recipe turn out well, but it completely revitalized our commitment. I’m a lot more confident that we can make REAL meals on our own. Thanks! Hooray! I’m so glad to hear that. This was so good. I used homemade Garam Masala in place of the spices. Would like to try some with Labneh on top.